Upon going into the attic for the Christmas decorations, my husband found abandoned art that had been stowed away for many years, in fact, since 1990. My first painting attempts began in 1990. As he brought down numerous pieces one, by one, I was shocked at how crude and amateurish they appeared. Knowing that their birth was 22 years ago didn’t help my astonishment. “Austin”, I exclaimed to my husband, “How could you let me believe that I had potential as an artist?” “I had faith in you”, he stated. 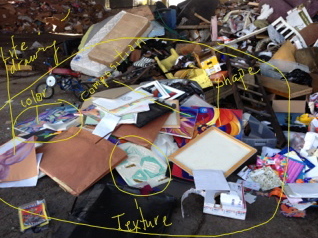 Well just the same, sending the art to the dump was cleansing. Each piece told a story and a potential addition to my future artist voice, including mood, love of color, composition, the figure, texture and design. As artists we do need faith that it will get better, that we will become better at our craft, that we will find our voice, and that we will be acknowledged as professionals. In the beginning, blind faith and seeing with the eyes of a newborn was a blessing. Mistakes and crude skills were accepted and acknowledged as part of the journey of learning and becoming. Support from others, teachers, friends, and family and their ability to see my potential was a gift. This is a great reminder to be mentors to the novice artist, knowing that we all had to take this journey. well said my friend, a very brave post! I have been on this journey with you for a long time and I have loved your work at each and every stage. As for support, you rock! You have been a tremendous support to me and all you encounter. Thank you for sharing your journey, insight, compassion, and fabulous art with us! Yes Shannon, we have been on this journey together for awhile. Hard to believe that time has flown by, thank you for the lovely comment. Coming from you Cheryl, since you know I love your writing, I really appreciate it. Thank you! Great post Janet and so true! It is so true that we need to be compassionate to others who may not be as far along in their skill mastery. Being a teacher helps your own skills as well–a bonus for sharing and helping others! 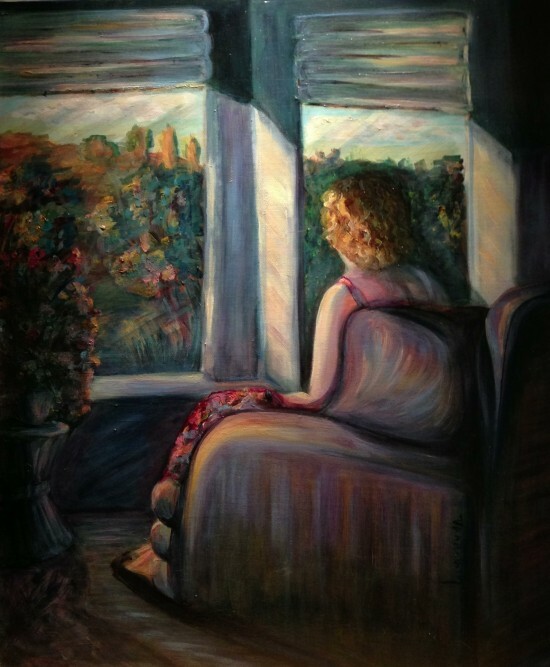 You know your first painting does sing of your love for color and sensitivity to your subject. Thanks for being such a supportive and wonderful online friend Janet! I enjoyed reading your story! Oh thank you Deb, for your support. Yes you are right teaching does help you learn and without the great teachers I have had in the past I wouldn’t be where I am. I bet you are a great teacher. Hugs and thanks for your comment. Thank you for sharing this, Janet. I was doing some cleaning over the weekend and found an old sketch book that I made when I was single and living on the other side of the country. It is always interesting to see where you have come from. Some experiments were good and some were bad, but they were all learning. I occasionally purge the old bad paintings, but I think I’ll hang onto the sketchbook. It is part of my history. A sketchbook would be a great way to see evolution and growth. Great idea Dixie, thank you! Yes I remember the 1990 painting………waiting…….waiting for what? This was such a powerful self portrait for this time in your life. I really liked the picture because it was so honest and pure, and presented a longing and a need that propelled you forward.